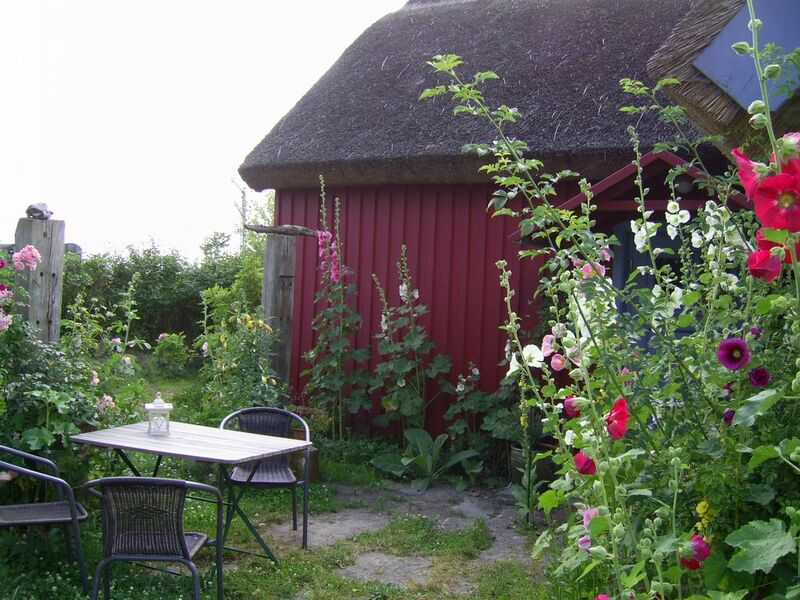 The thatched house in the middle of the salt meadows at the old train station Bresewitz near the Bodstedter Bodden and Meiningenbrücke bridge, surrounded by disused tracks of Darßbahn, is an oasis of tranquility, peace and relaxation. The large, enclosed garden property with fruit trees, flowers and herbs, and the lovingly designed house on 75 m² living space, offer throughout the year (last minute or longterm) an ideal accommodation for those seeking peace, nature lovers and bird watchers, active holidaymakers, families and individualists. The house in a rustic style with wooden beams and planks, with a very pleasant indoor climate all year round, has 2 bedrooms, 1 combined living / dining room with large dining table, 1 large bathroom with bath, rain shower and underfloor heating, and 1 modern, open country kitchen. The covered west terrace and the beautiful garden, are inviting you to enjoy the wonderful sunsets and the magnificent migration of cranes. By car: The Arrival by car A19 / A20, exit Sanitz, drive further through Ribnitz-Damgarten direction Barth through Fuhlendorf / Bodstedt - Pruchten to Bresewitz. Or A20 from Berlin, exit Stralsund, B105 towards Rostock till Löbnitz, then take L22 towards Zingst / Prerow. By train: Arrival by train to Barth, continue by bus to Zingst / Prerow or taxi 7 km to Bresewitz. Bus: Bus L210 to Bresewitz. Buses run on the from April to October with a bike trailer. You can find timetables under: http://www.nvp-bus.de. Baltic Coast Cycle Route (D2) is only a few meters from the house. The sandy beach between the Baltic seaside resorts Prerow and Zingst can be reached by bike in 15-20 minutes. The Meiningenbrücke bridge is a picturesque and historic bridge over the Meiningenstrom that connects the peninsula Fischland-Darß-Zingst to the mainland. The rotating part of the bridge opens at scheduled times. Windsurfing, kite surfing and sailing on flat and calm waters of Bodstedter Bodden or on the Baltic sea, one of the best wind surfing areas. Horseriding through the nature reserve is possible from neighboring town Pruchten. Be sure to check out and try: "Lou Lou's Ice" in Zingst, homemade pies and cakes "Cako" in Zingster harbor, the cozy "Teeschale" in Prerow, "Pizza Garten" in Zingst, homemade sourdough bread and cakes in "Bio.Delikates" and cocktails in "JAMBOLAYA" in Barth harbor. For ceramic, souvenier- and driftwood Lovers: ceramics workshop Uta Löber in Ahrenshoop, Norddeuche Lebensart by Elke Behrendt in Barth, handicrafts made by Ines Rausch in the gallery Galerie Meeres-Rausch in the western Harbour in Barth. Bike rental with delivery possible. Linens - towels - bath towels for 10 € per person. Cozy covered west terrace with 8 chairs. Sehr netter Vermieter, angemessener Preis. Das Haus ist absolut ruhig gelegen, trotzdem ist man in wenigen Minuten in Zingst oder Barth. Die Einrichtung ist total gemütlich, gute Betten, riesiges Bad. In der Küche ist alles vorhanden und es richtig Spaß und Erholung gebracht! Bei perfektem Wetter haben wir einen der schönsten, wenn nicht sogar den schönsten Urlaub verbracht. Das Haus ist sehr schön eingerichtet und man findet alles vor, was man braucht. Sehr gut hat uns die ruhige Lage mit Blick auf den Bodden gefallen. Morgens kann man einfach die Tür aufmachen und die Kinder im Garten und der Umgebung laufen lassen. Das Haus liegt direkt an einem Radweg, sodass man mit Kindern sofort zu kleineren und größeren Touren aufbrechen kann. Wir haben im Winter (na ja, verschneite Ostern) eine Woche in dem Häusschen verbracht und es sehr genossen. Vor allem hat uns gefallen, dass die Einrichtung hochwertig und gerade im Vergleich mit anderen Ferienhäusern sehr geschmackvoll ist. Toll ist auch, dass man ein ganzes Haus für sich hat, welches am Ende der Ortschaft mit schönem Blick auf den Bodden gelegen ist. Gleich nebenan verläuft ein Fahrradweg, von dem man auf den Darß fahren kann. Der Vermieter ist auch sehr nett und hilfsbereit - er wohnt gleich um die Ecke. Wir können das Haus definitiv empfehlen.